Almost every workplace is prone to hazards. Be it from falling objects, falls, skids or opens electric wires, there are dangers everywhere. According to statistics there are immense injuries and even deaths resulting from work related hazards. Organizations often lose a lot in terms of compensation and lost human resource opportunities. There is no telling when an accident can occur but the good news is that most of these hazards can be minimized through the use of line marking tapes and floor tapes. Construction sites top the list of the most hazard prone areas. With so much going on safety standards might fail to be strictly adhered to and this can expose the workers and passersby to great risks. It is hence crucial that they maybe adequately informed of the areas to avoid. Line marking tapes can be used to forewarn any passersby to exercise caution when approaching a certain site. Floor tapes can be used to indicate the safest pathways to use so as to avoid falling objects or other dangers characteristic of a construction site. If it is a renovation project being carried out in the office temporary line marking tapes can be utilized to warn the occupants of the potential hazards. They can also be used to redirect people towards am alternative entrance or exit. Various colors of line marking tapes portray different messages. In the workplace, there is a need to warn people of the existing dangers. In the industrial organizations where there is possible exposure to hazardous materials if it important to erect permanent measures to ensure that all those concerned are adequately aware of the danger lurking within. 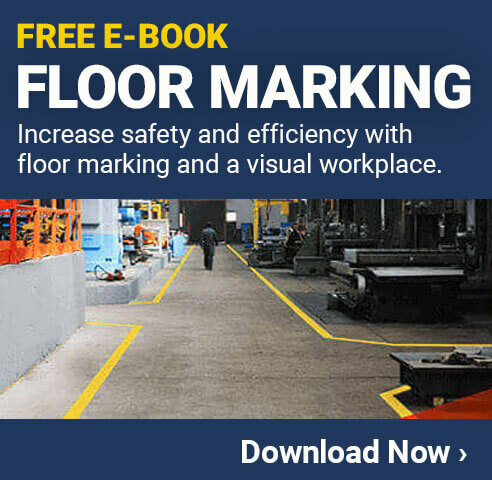 Relevant floor tapes can be used to reflect danger. A tank that contains oil products should be conspicuously marked to warn any persons within the organization to avoid bringing flammable objects near the site. Warning tapes should also be applied in areas close to the chemical labs and pits amongst others. The colors used and the location of the tapes should be clear to all. To ensure visibility is unaffected even during dark hours reflector tapes can be used as they glow in the light. To reduce the risk of vehicle accidents or case of pedestrians being knocked down within the organization it is important that traffic be controlled. This can be achieved by strategically applying informative and warning tapes in areas that are most prone to accidents. Slowing down or stop signs should be conspicuously placed. The parking bay is also in need of adequate markings to guide the drivers and avoid unnecessary collisions and delays. Line marking tapes come in handy in the parking areas as they give the required directions about where the vehicles are to be parked and the specific areas that are reserved. This can be a great way of ensuring the safety of the pedestrians and also of the vehicles.